"AZENCO" performs its manufacturing and construction inquiries and requests of clients and customers. Customer satisfaction with the execution of the order and effective - is one of the important issues. For this purpose, the analysis on a regular basis for the study of the demands and expectations of consumers. "AZENCO", the manufacture, construction and installation works, preparation of raw materials, equipment and other assets, building mutually beneficial relationships with staff and partners. The company's management in order to provide high quality analyzes on a regular basis and take remedial measures for errors achieve the necessary results. "AZENCO" in order to improve staff knowledge regularly conducts training. 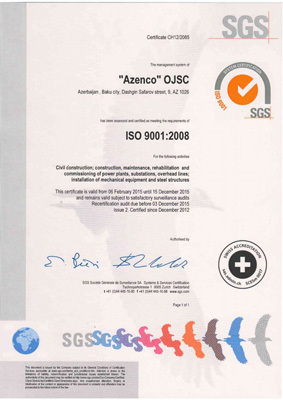 In "AZENCO" process management in the company is the basic principle. Processes of mutual coordination and central control is one of the priority issues. "AZENCO" operates under the laws of the Republic of Azerbaijan, as well as in accordance with international standards. One of the obligations of the company when dealing with contractors, enterprises, institutions and partners, the adoption of management systems to ensure accessibility policy. Company Policies "AZENCO" is a key strategic tool in its future activities. Chairman of the Board of Directors of JSC "AZENCO"
The company's management "AZENCO" stated that their goal within the existing local and international construction, manufacturing and maintenance requirements Health, is to create a safe working environment. To implement this policy, and prevent hazards to be taken all the necessary measures. In addition, the work must take place in a secure industrial premises and using the most advanced and secure technologies. To ensure the safety of their processes, we are guided by normative legal acts, regulations and other legislative requirements. Studying and analyzing all the processes are carried out appropriate measures for staff training. Working with partners and contractors, our principle is to ensure that health and safety policy. Conducted training for safety and proper personal protective equipment (PPE), also created the conditions necessary for first aid and medical services. On a regular basis, revised policy on health and safety and, if necessary, modified. Appropriate measures are taken to improve the skills of employees of the enterprise in the field of labor. 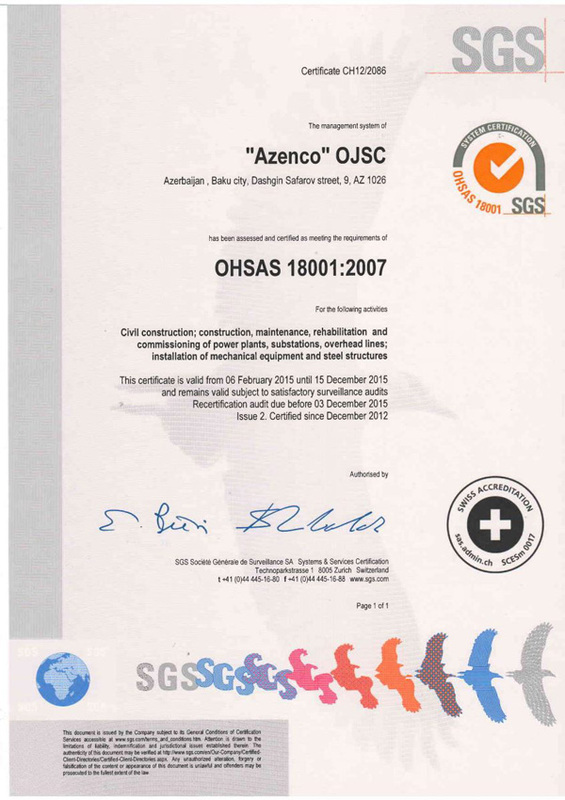 Company «AZENCO" applies all the principles of safety, which can prevent or minimize any risks. To comply with the international agreement documents (conventions, agreements, protocols), as well as international and local legislative requirements related to the protection of natural resources. To reduce maximum level of environmental risks that can arise for public and ecosystems in the field of our activity. To apply environmental safety management system in our activity. To implement continuous monitoring of the environmental impact of environmental aspects during design, construction, manufacturing and maintenance processes. To provide accessibility of ISO 14001 standards (environmental management system) to contractors, companies, institutions being in contact with the company. Azenco OJSC tries to achieve implementation of this policy by using all measures possible for prevention or minimizing hazards and risks to be prejudiced to environmental safety during work by complying with all principles.